To Kill Your Darlings, as William Faulkner phrased it (or paraphrased from Sir Arthur Quiller-Couch), is to avoid complacency and remain objective in one's own work. Should a piece of writing seem perfectly fine, utilizing anecdotal or trivial evidence to satisfy ego demands — ostensibly servicing the favourable idea of self — then it likely isn't as good as the writer believes it to be and should be scrapped, according to Quiller-Couch and Faulkner (someone that struggled to take his own advice). 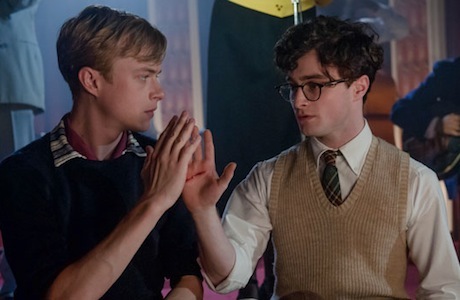 Oddly, this biopic about the love quadrangle between Allen Ginsberg (Daniel Radcliffe), Lucien Carr (Dane DeHaan), David Kammerer (Michael C. Hall) and, less directly, Jack Kerouac (Jack Huston) doesn't take this advice at all, at least in narrative execution. The story, despite stemming from a conflict between ex-lovers Carr and Kammerer, is framed through the eyes of Ginsberg, after he leaves his needy, mentally ill mother (Jennifer Jason Leigh) to attend Columbia, where, as we learn, he meets Carr, Kerouac and William Burroughs (Ben Foster). While introducing this world and these noted beat poets, first-time feature director John Krokidas can't help but throw in an endless array of prescient commentary from the boys referencing the works they'll create and the cultural influence they will have in years to come. These referential nods, or "darlings," if you will, though initially alienating, do eventually subside for what proves to be a surprisingly touching coming-of-age story. What's peculiar is that this story — one that should implicitly speak to inspiring change through literary revolution while demonstrating adverse thinking — ultimately proves to be a very conventional tale that would have been equally effective if the characters were fictional. Ginsberg (an introverted, closeted homosexual) seeks the friendship and companionship of Carr out of lust and ideation. Carr is the sort of performative, hyper-realized personality that jumps onto tables in crowded libraries to mock the status quo and who heads downtown after class to party with avant-garde artists. He represents the excitement and externalized divergent thinking Ginsberg internalizes. As literary tradition goes, larger than life personalities — ones that inspire the diffident to come out of their shells — tend to be quite damaged, seeking out mousy people that will validate their egos and indulge their self-sustaining delusions. Ginsberg, whose increasing awareness of self and eventual tragic realization of worldly disappointment as an identity-defining trajectory, is blinded by passion and love, seeing that Carr's relationship with Kammerer — a man that is consistently hostile-adjacent to Ginsberg — has some turbulence and peculiarities. Though Ginsberg is indirectly warned about Carr's tendency to use people to sustain his high — a metaphor unexploited despite the early recreational drug experimentation when Burroughs is introduced as a peripheral, almost incidental character — he continues to write his papers and work on their youthful manifesto to change the world through writing. It's only when Kerouac enters the picture — a "real" writer that Carr favours to the eventual author of Howl — that Ginsberg starts to see through the cracks, still allowing himself to be taken advantage of, but knowing enough to hate himself for it. Surrounding this classic tale of the ideology-shaping influence of tragic first love is the noted murder of David Kammerer by Lucien Carr. The pointed vitriol within, noting an "honour killing" law that would allow a heterosexual man to kill a homosexual that made unwanted advances, has enough political bite to correspond with some of the struggles going on within a modern context. Presumably, this suggests that killing our darlings means to continue the fight for equality and evade socio-political complacency over a few placating advances. It would explain why Krokidas isn't interested in utilizing the ideological tropes of the beat generation, beyond indulging in the aesthetics of the time. Kill Your Darlings is intent on capturing the pain of marginalization, telling the story of what kind of hurt and horror can stem from forcing people outside of the mainstream social spectrum. In doing this, it is quite effective and heartbreaking, capturing the struggle to remain true to the self while catering to the needs of the rigidly defined status quo.